Friday 13th April - The Soul Strutters. Free entry - First come first serve basis. Drinking and Dancing doors open at 5pm with 2-4-1 on cocktails until 8pm. The Soul Strutters from 9pm. DJ Asian Hawk from 11pm-late. 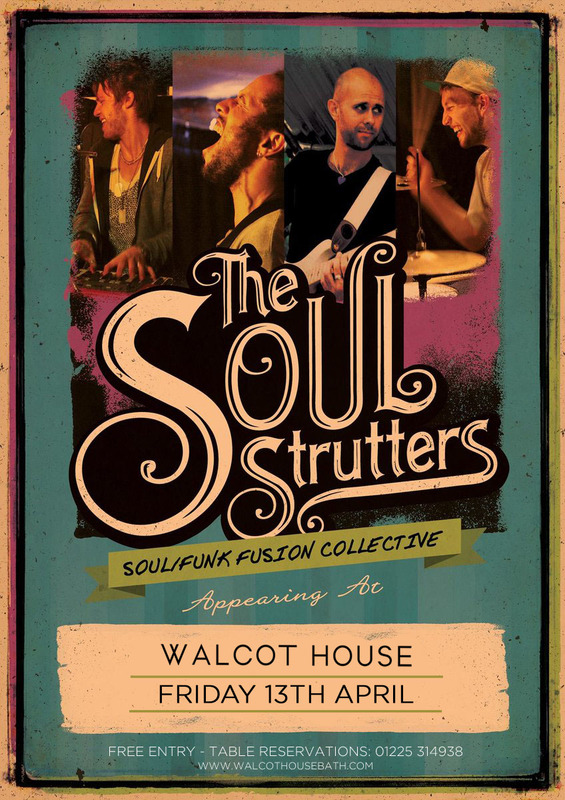 Due to high demand the Soul Strutters are back at Walcot House. The Soul Strutters are a collective of professional musicians from Bristol who love nothing more than performing specially handpicked songs from the golden era of Funk, Soul, Disco and Rare Groove. They are widely regarded as one of the busiest Funk and Soul bands going. Formed at last-minute in October 2012 for a cocktail function, The Soul Strutters gelled immediately after the first 4-bars of ‘Use me Up’ by Bill Withers was performed. From then on, the band were playing the circuit of live music venues near enough every weekend around the Bristol and surrounding area to the present day, solely through word of mouth. The group was founded on a mutual love and respect for the music they grew up on and have always wanted to perform, and from the sheer smiles on their faces from start to finish, it’s clear that the passion and enjoyment radiates through to the audience. By the end of 2016, Soul Strutters have completed over 900 gigs and over 200 weddings all over Britain, with 2017 proving to be their busiest year yet. Unlike many wedding and corporate function bands, the Soul Strutters formed absolutely organically, with the single intention of jamming together for fun. Since then, they have become a full-time band gigging at a variety of special events, including weddings, anniversaries, birthday celebrations and charity events. With a professional attitude towards all bookings you can be assured that the Soul Strutters will surpass your requirements, and put on a great show for your event, bringing all of their enthusiasm and passion to your stage. Whether it is a small intimate pub gig, a background entertainment in a restaurant, a live music venue or a wedding, it won’t be one that your guests will forget, and you’ll struggle to find a live performance tighter than The Strutters! Asian Hawk aka O.Love The Turntablist Turned Troubadour is one of the most original DJ/singer songwriters operating in the world today. Possessing not only the technical skills to hold numerous DMC titles but also the musicality to captivate and rock every audience he plays for. production has included tracks for artists such as Foreign Beggers and The Disablists. Having Initially featured in the Bristol based acid jazz funk group "JACKSON" vocal prowess has led to him becoming a seminal member and frontman of this eclectic super group. Asian Hawk first attacked the turntables in 1998 mixing Drum'n'Bass before developing a life long love affair with HipHop and Turntablism. By 2000 he was a resident at the legendary Moles nightclub rocking weekly shows in a homegrown group of friends called "Non Compos Mentis" (NCM) consisting of Rapper Gusto Fresh, and Beat Boxer and Vocalist Mo Kolours. During that time Hawk found Himself achieving the UK number one title in 2006, countless runner up places and most recently claiming the Vice World title in the DMC online battle for 2012. Since then Hawk has been involved in numerous projects, including running community scratch courses, to producing tracks for Boris Johnson's Transport for London campaign and working with artists such as Reginal Omas the Third, Declaime, Mo Kolours and more. Hawk hosts a radio show on www.Soultrainradio.co.uk every monday evening, as well as having radio and TV appearances on, 1xtra the Semtex show, Ras Kwame's 100% homegrown, Kiss FM with Big Ted and Shortee Blitz, BBC's Blue Peter, Channel 4's Paul O'Grady show and CCTV in China. Hawk has performed at numerous venues and festivals across the globe, these include the flagship store of Maharishi's diffusion line MHI, DPMHI - London (www.dpmhi.com), The Hammersmith Apollo, KOKO Camden, Shepard's Bush Empire, HipHop Kemp (Prague), Mix CLub (Beijing), Q Bar (Bangkok), Pontoon (Cambodia), Boomtown & Bestival. Now open from 5pm - 7 evenings a week as a destination cocktail/wine bar with dining.